LAZY J's super simple simple Storch build "THE BUDGIE"
Thought I would share my recently completed build of a 3 channel modification based on the FT Simple Storch - this one has come about due to the need of something nice and simple to introduce my 10 year old nephew to the art of aeromodelling. The general goal here was a simple three channel trainer (RET) that was not too small/twitchy and that was a nice easy build with perhaps a few mods to make it both lighter and more durable. Looking at the FT simple Storch the idea was set and the build got underway. To be clear this really is not a build log as such and most of the mods were using the TLAR (that looks about right) method so no plans but I am more than willing to take measurements or answer any questions from anyone who may want to recreate something similar. Jumping forward to the airframe completed with a few notes. Unusual for me in that I gave in to the quick and easy hot glue gun. Using the bare minimum to hold the airframe components together I found that a lightweight airframe is definitely still possible (688 gram/24 oz final AUW). I also moved to a simpler and stronger non scale undercarriage layout with mounting points being two layers of balsa layered at 90 degrees. The first layer being cut level with the outer fuse skin with the grain running 90 degrees to the undercarriage wires to avoid splitting of the material and the next layer recessed internally with the grain running across the fuse for some strength. The undercarriage is then held on by 4 small flat clamps cut from popsicle sticks and secured into the mounting blocks by servo screws. To this a nice big pair of 3.5" tyres were added. A useful (and cheap) tip to add to the above is the use of automotive crimp style electrical connectors for wheel collets. I generally use the ring style connectors by first cutting/pulling away the coloured insulation, snip off the ring and then slide them onto the undercarriage wire inside and outside of the tyre. A small dab of glue and a quick crimp with the pliers make sure they won't come off on their own. The control surfaces were then cut from the vertical and horizontal surfaces without the scale counterbalances with RTV silicone used as a hinge. This is a super simple, strong and reliable hinging method I picked up from slope combat. Basic method is to lay electrical tape along the hinge after covering/painting, feed in a small bead of silicone and then wipe away the excess with your finger leaving to dry overnight. If applied too thick you can score the surface with a razor to increase the flexibility of the join and if the tape pulls some of the silicone away the procedure can be repeated. If there are just small gaps/holes more silicone can be dabbed in the gaps with a finger. Next on the list of things worth mentioning would be the changes made to the fuselage. Not too much to mention here with it for the most part being built as per the plan. I removed the paper from the inside of the rear fuselage half but with the likely abuse that this airframe will likely see decided to leave the front half untouched. Those with a model or two under their belt may consider removing this for a further reduction in weight although the servos would likely have to be moved way forward to compensate avoiding the need to use lead in the nose. I removed the standard wing saddle and instead added two 5mm balsa sidings instead - in hindsight these should have been made a bit longer to completely encompass the wing dowels but currently do seem to provide enough strength as is. Further mods to the fuselage revolved around the engine pod and battery mounting. The pod was made non removable and no reinforcing tape was used. This was then simply glued together and mounted solid to the airframe with an additional healthy bead of hot glue along the front edge of the plywood firewall. 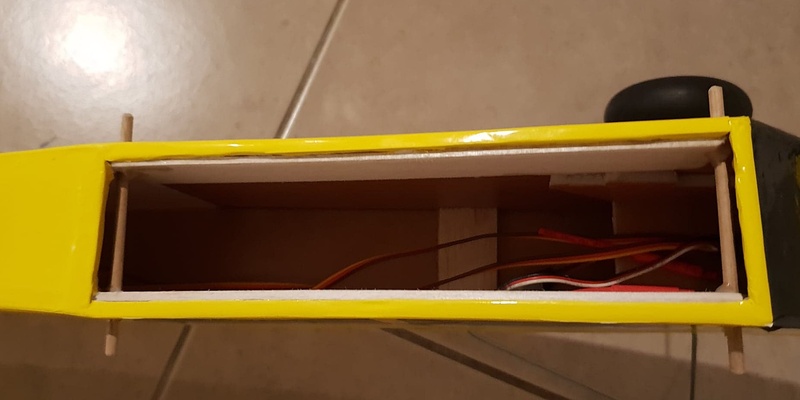 A simple battery box to fit the 1300mah lipo as far forward as possible while allowing a hatch to close was made and mounted. The speed controller was then fitted vertically through a slot in the motor pod as far forward as possible. The hatch is just a simple foam board piece hinged with film and held close by a small strip of tape. So far even with the somewhat limited airflow things have remained reasonably cool and all seems to work well. Onto the wing and obviously the biggest deviation from the plans. This was to be a 3 channel aircraft so ailerons were dropped and I avoided the faceted style aerofoil typical to FT builds instead choosing to go with a more rounded and typical flat bottomed section. This is super easy to achieve by cutting the lower surface long enough to protrude past the upper surface. A 30 degree bevel was then sanded into both surfaces of the leading edge (as per my Baby Blender build mentioned above) and a 30 degree bevel sanded into the bottom surface of the trailing edge. The internal paper was then removed and a 5mm balsa spar glued onto the lower surface at the 30% (ish) mark. Once done the leading edge and spar are fed a bead of hot glue and the upper surface folded over (no scoring of the surface needed). Once set the trailing edge was then glued down and finally trimmed to be flush with upper surface. In hindsight and for future builds I would likely consider reducing the leading edge bevels to 15 degrees and adding 3 - 4 leading edge ribs per wing to further improve the aerofoil section. Next the wing tip was propped up to give a dihedral angle that would give a good balance between handling and stability and a flat sanding block used to sand in the angle required on both panels. Finally a length of 1" bidirectional tape was run along the bottom of the join and the two panels glued together using hot glue. Making her look pretty was next. Hobbyking yellow film, silver and black sign writers vinyl, chequered automotive race tape and black pinstriping were used. 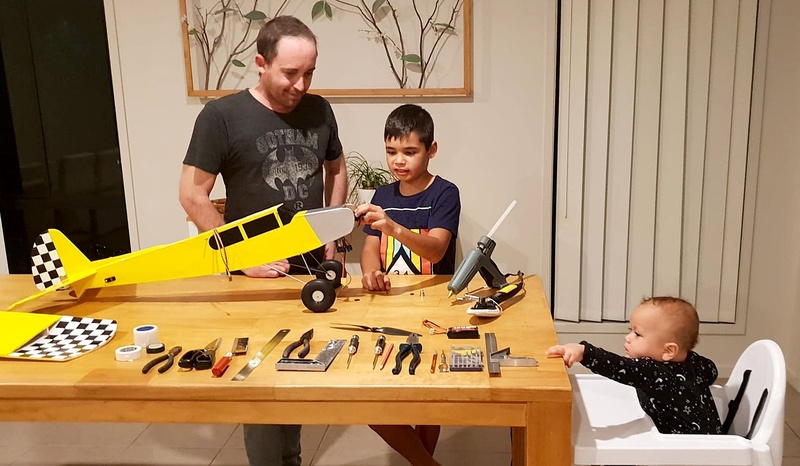 ...and here is the crew - myself, my nephew the trainee pilot (wants to fly fullsize and hang gliders like his uncle someday) and my 8 month year old baby boy (already showing advanced signs of aeronautical sickness) hard at work well past all our bedtimes! For power the Flitetest 'C' size power pack was used (an excellent and no fuss way of powering your plane) with a small 1300mah 3 cell lipo supplying the juice to further help reduce our AUW. On that note with the use of lighter glues, lighter wheels, more internal paper removal and maybe strategically place lightening holes in the wing and fuse an AUW well under 600 grams would be more then possible... something I am very tempted to try if I ever get to the bottom of my current list of builds! lol. And that guys about wraps it up! I especially love the photo with the tot reaching for the square. In a few years you'll be building with both kids. What a sweet build! and great pics. I especially love the photo with the tot reaching for the square. I love that checkered tape (going to have to look for some). Looks awesome. Great list of modifications. Thanks all for feedback and happy you enjoyed my build, ideas and pics! 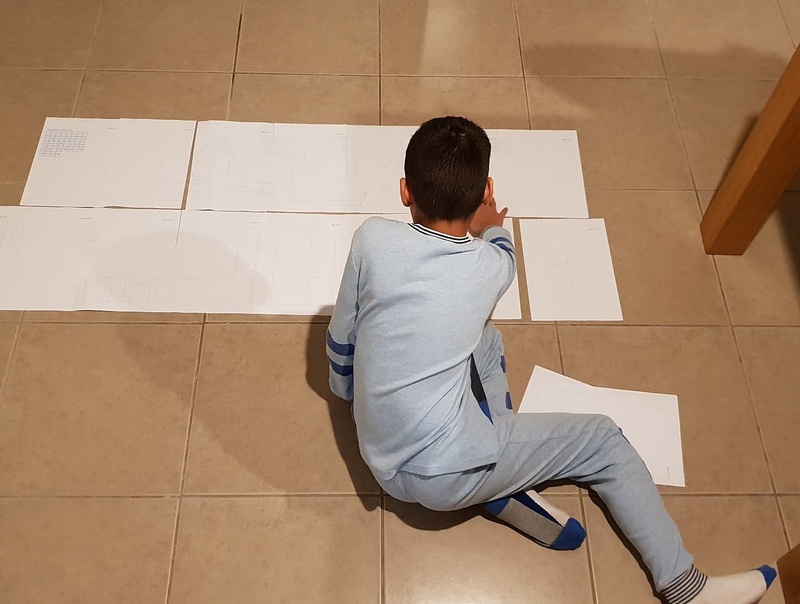 In regards to my boy, being the little fella reaching for the square (alongside anything else even remotely non baby friendly within arms reach), it's fair to say he'll be lining up before too long for his first build! 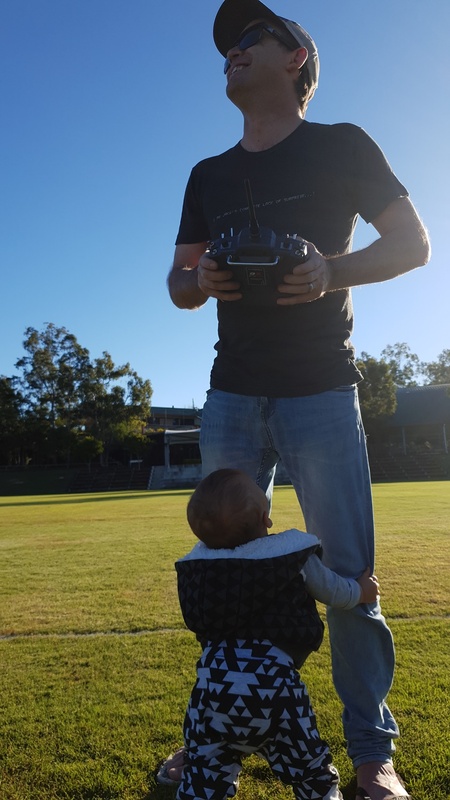 My little wingman is already obsessed with anything that flies... from birds we feed in the yard, to waving at planes that fly overhead to the local airfield to anything on the building board. 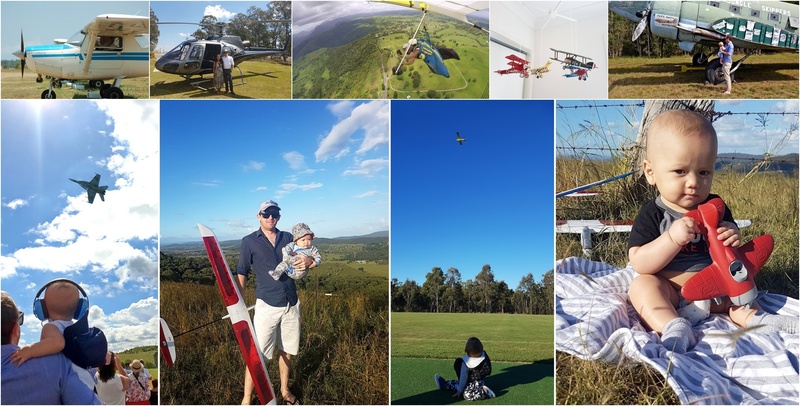 To be fair to the poor little lad he really has had no chance of avoiding the aeronautical disease - before he was even born he had been hang gliding with my instructor, flown Cessnas and taken a helicopter ride out for lunch. Since meeting the world he's been forced to stare up at his mobile made of WW1 greats knocked up by his obsessed father, been dragged around every airfield within a 3 hour drive, forced to sit on various hills watching his dad throw himself off in an oversized kite and suffered hours spent sitting around while his dad flies his toy planes around! Now for the promised flight videos alongside my usual observations, mods and rant. 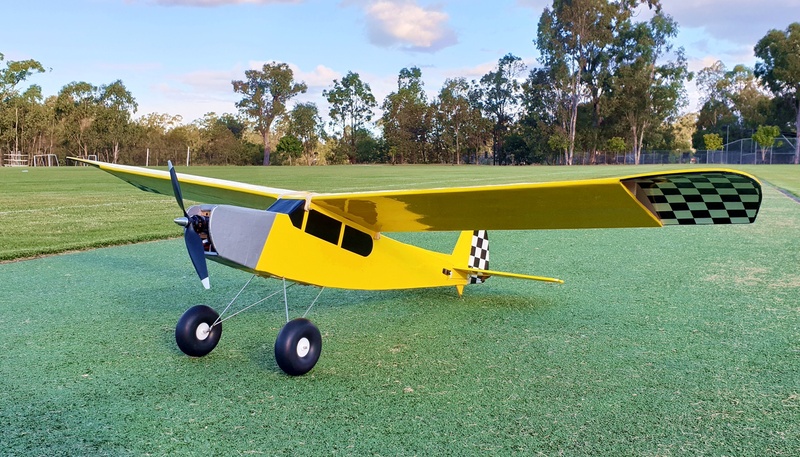 The maiden flight was pretty uneventful - a quick glide test to make sure the wings sort of worked followed by a hand launch and, after a couple of clicks of trim, she was away. Putting her through her paces showed some promising handling characteristics. Enough dihedral to make the stock rudder more than effective enough for turns but not too much to make it overly self correcting (moderate turns will generally be held without input after being initiated until opposite rudder is added). 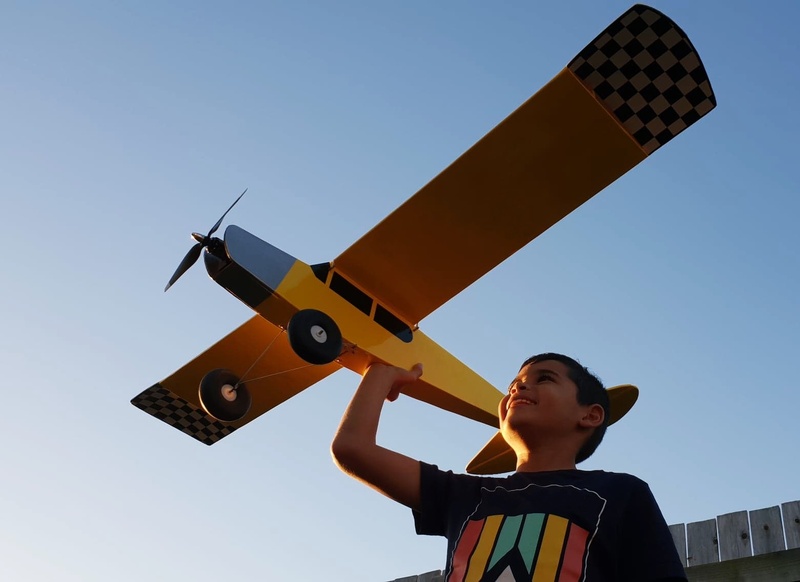 A note here for those first time flyers (or those teaching themselves to fly) is to perhaps increase the dihedral by quite a bit and add some extra rudder and vertical stabiliser area to create really stable self centering flight characteristics. - Stalling, although at very low airspeed, would result in a sudden drop of the left wing and instant spin - although a lot of fun this would not do for training. General diagnosis was the trailing edge of the wing tips being overly cambered giving too great of an angle of attack alongside a slightly warped elevator. Both were gently bent back a touch and the covering reshrunk to hold the shape. This instantly transformed the stalling characteristics to barely a bobbing of the nose except under extreme up elevator application. The elevator still shows a slight warp on the left side leaving me to believe that the elevator may have been the main culprit all along by initiating a rolling moment to the left enough to induce a spin (next flight will be made to confirm). - Power application results in a rapid pitch up moment. I added a lot more down thrust after the maiden than called for in the plans but unfortunately the problem persists. 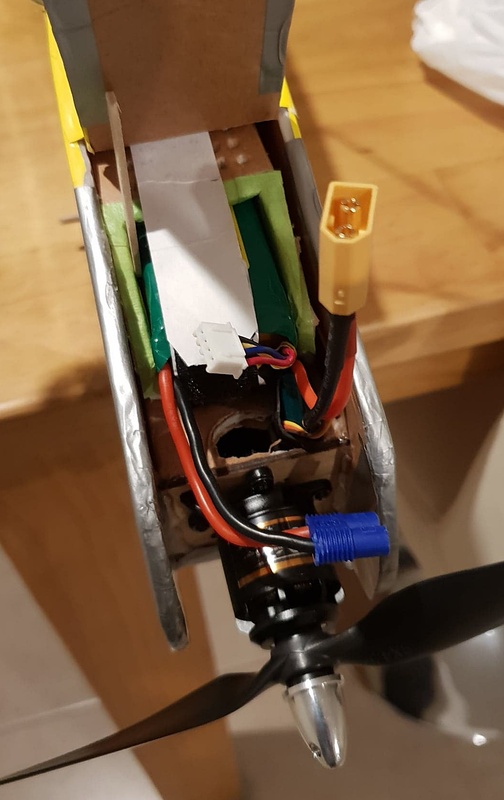 This may be the result of the flat bottomed aerofoil as airspeed rises (typical of this type of section) but more down thrust has now been added and the next flight will confirm if the issue can be resolved. Regardless, left to it's own devices pottering around at less than half throttle, this pitching is not prevalent so will still make for a great training plane. - The original undercarriage was too weak. Originally an experiment made of pushrod inners I was hoping for enough strength for normal operations but the ability to deform under heavy impacts. This was replaced after the maiden by a 2.5mm piano wire frame as seen in the following video. Take off was between half and three quarter throttle and most of the flight was at less than half throttle despite the tired old lipo. Current flight time is an easy 8-10 minutes. The next video was about starting to test the slow speed handling. Not really pushing it's lower limits as of yet but it shows a lot of promise. Unfortunately I was also carrying around 60 grams of nose weight that will be removed once I move the CG rearward as well as moving the servos from their rearward position forward enough to counterbalance. So that wraps up the current flight test program and makes her ready for the nephew's first flying lesson this coming weekend. I think you posted the edit links to your youtube videos. Use the play links and when you post, click the three dots (ellipsis) with the drop down arrow and paste the link in the dialog box. This will embed your video and we will see a thumbnail instead of just a link. You have a beautiful family and a beautiful plane. Congratulations on successfully building both. You have much to be proud of. Thank you for sharing with us on our forums. Sounds awesome LAZY J (I've been trolling this thread). Love the work on the plane (looks awesome!) and especially love that the kids are involved too. The links to your vids aren't working. Looks like you copied the link from the editor. Just view your channel like a normal user and use that link instead. Links usually look like "www.youtube.com/watch" and then like the video ID after that. Thank you guys for the feedback and also the heads up regarding the links! You were both absolutely right, in my rush to get off to bed, I had posted links from the editor. Vids are now up so thanks again guys! Just thought I would share some of the adventures and success of the FT Storch build. My young nephew has now completed his second day at the airfield (3rd to follow this weekend) and is progressing very well. Unfortunately both days have been a touch on the windy side but despite the challenge, alongside some simulator time, will be solo and ready to upgrade (expect a Bloody Baron build before long!) in no time lol. For me she has become a great "go to" plane for a lazy arvo flight... there is a lot that can be said for a simple flyer for those no hassle wind down afternoons! Super simple to set up, easy to fly and next to no risk of a serious crash. The only other options to control this now, short of building a semi symmetrical wing, is to shim up the trailing edge of the current wing to make a change in incidence (losing some of her ease of slow speed control) and/or to limit the power output. All in all I am happy to live with this as flying around at a third to half throttle is where she really shines. So that about wraps it up I reckon! I would like to offer a HUGE thanks to the FT crew for offering such a great service to the RC community with their free plans, fast build kits, brilliant build videos and a great list of hardware that works superbly well!